Check out these little guys from my garden. 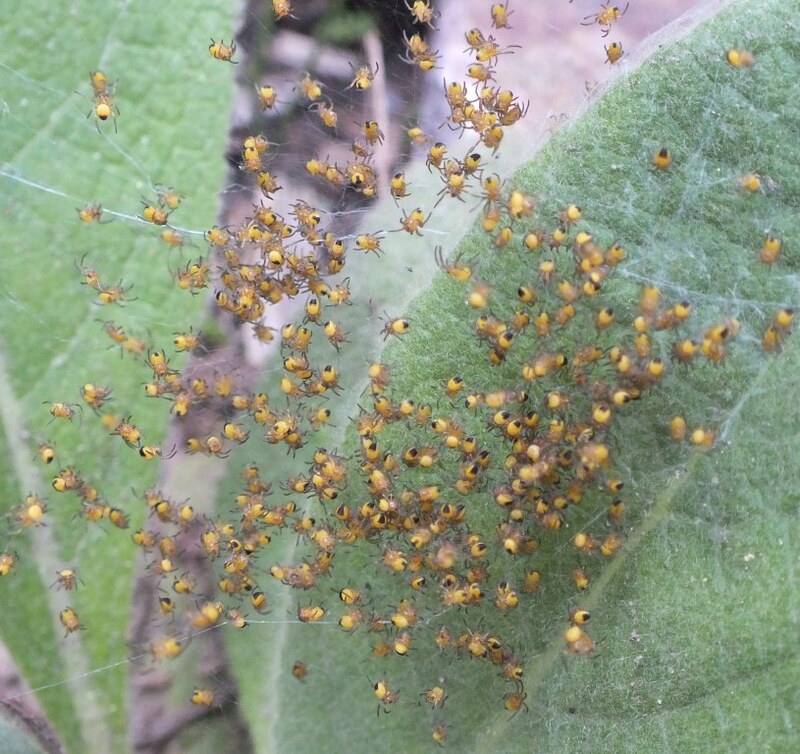 A whole bunch of websites and photo collections identify these as baby European Garden Spiders (Araneus diadematus), but the colour of the babies do not match the adults. My spidey senses tell me that’s not right. Other folks have identified them as baby Black and Yellow Argiopes (Argiope aurantia). These I’ve seen around here. One of them had a web across this same garden last summer. The babies look very much like the adults, so that makes more sense to me. Any experts out there want to weigh in? 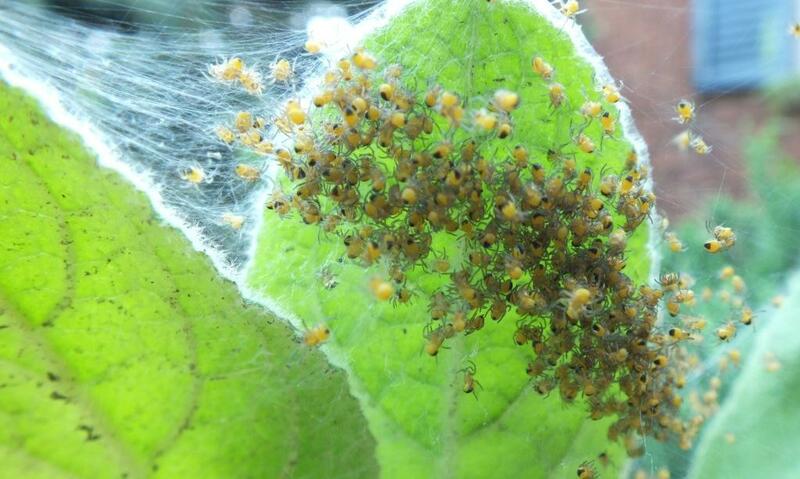 Assuming they are argiopes, then these babies hatched last fall and overwintered in a a silk sac. This spring they emerged and until they get a bit bigger, will huddle together in the safety of the web around them. Argiopes are your typical orb-weaver spiders, the ones that make those beautiful circular webs that stretch across meadow paths or your garden. 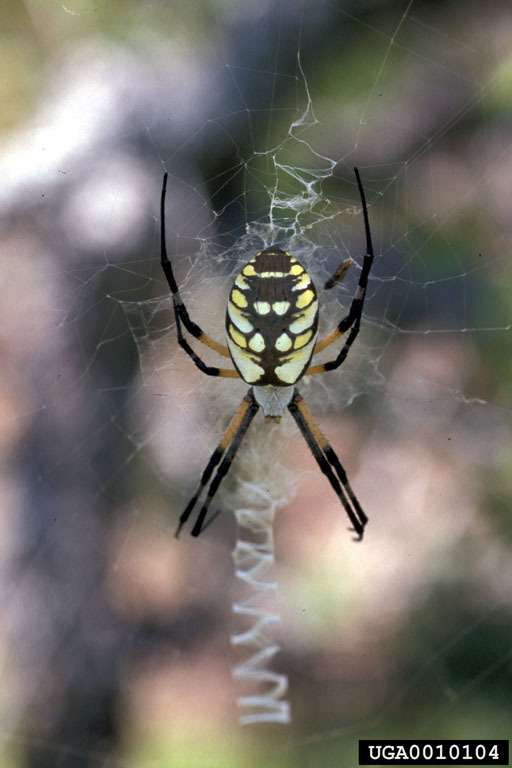 One of the common names for the argiope is the writing spider. 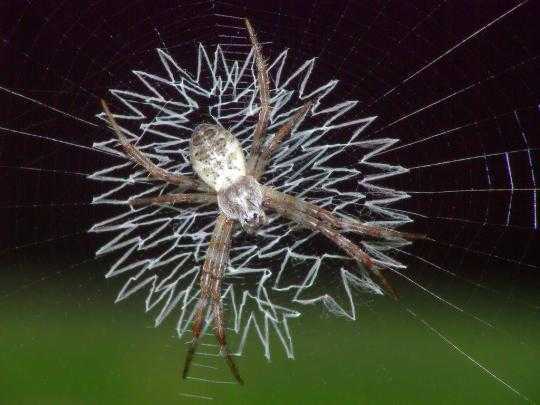 This is because their web decoration, known as the stabilimentum, sometimes resembles writing. Stabilimenta come in many forms, from zizgags to spirals to run-on sentences, and a single spider may change its design from day to day. The term suggests that the purpose of the stabilimentum is to stabilize the web, but that does not seem to be the case. A number of other theories on the function of stabilimenta have been tossed about; that they serve as an advertisement “web here!” to prevent birds from flying into them or that they attract prey insects. At least one study (Blackledge and Wenzel, 1999) has shown that the web decoration does serve to reduce bird damage, but it comes at a cost. 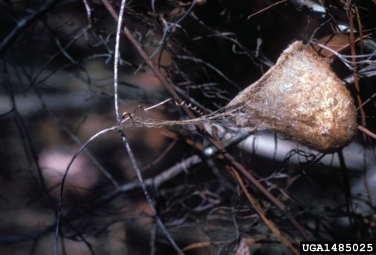 The same study shows that fewer insects are caught in webs containing stabilimenta and that sometimes hungry spiders do not take the time to add the decoration. Also, some studies have shown that stabilimenta actually attract insects that prey on spiders. And yet further studies show no discernible difference in prey or predator attraction between orbs with stabilimenta and orbs without. Another hypothesis is that the stabilimentum serves to conceal the spider in the center of the orb and at the same time allow it to move about. This hypothesis has been both supported and rejected by studies. It is, however, known that stabilimentum silk has an interesting property that it does not share with regular orb silk, and this may hold one key to its purpose. In its evolution, orb spider silk has trended towards becoming less visible to prey insects through a steady decrease in ultraviolet (UV) reflectance. However, the stabilimenta silk has retained its more primitive UV reflectance. This means that its presence wouldn’t just make the web a bit more visible, it would act like a neon sign, loudly advertising the web to insects that can detect UV. At the same time, however, unlike ancestral silk, stabilimenta also reflects large amounts of blue and green light, colours not readily discernible by insects. Could this somehow balance out the UV and render the stabilimenta invisible again? In an elegant study designed to test this idea, Blacklege (2000) trained honey bees to forage at artificial flowers made of primitive tarantula silk and flowers made of stabilimenta silk. Both of these reflect UV but only the stabilimenta silk reflects blue and green. The bees were easily able to detect and take nectar from the tarantula silk flowers but were hopelessly unable to differentiate between the stabilimenta flowers and blank targets. Essentially, they were blind to the the stabilimenta silk. The purpose of the stabilimentum remains a puzzle even after more than a century of inquiry and this may well be because there is no one answer. The stabilimentum for one spider may serve a different purpose than for another. It may vary among species or even within species depending on the spider’s immediate environment and local prey and predator makeup. In any case, I’m happy to have discovered my baby argiopes. I know they’ll probably catch the wind and take off today. 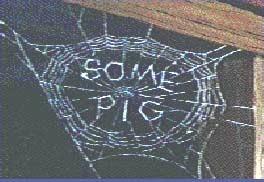 But I’m hoping at least one stays behind to spend the summer suspended over my garden writing her mysterious message in her web. I am sorry to say I agree with your first ID, they are Araneus diadematus, they do not look like adults, but they are very easy to identify. Cool post anyhow! Hi Blackbird, Thanks for your comment. I’m sure not an expert, so you could be right. I based my guess on a couple of online sources that said that baby Araneus look like more like the adults and the fact that I have seen black and yellow argiopes around here. But, honestly, I can’t tell the difference between the two species’ babies. I’m hoping one has stayed around and will build a web. If so, I’ll post a picture here.